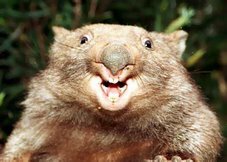 The Red Wombat Hole: SOS - No privatisation of Sydney ferries! Sydney, August 21 - It was a nice day to be out on Sydney harbour. 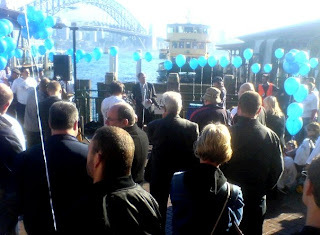 But we were at Circular Quay not to go on a relaxing ferry ride but to protest against the planned privatisation of Sydney ferries by the NSW Labor government. The Maritime Union of Australia had organised the rally but it drew support from a range of other unions, including the Nurses Federation, whose members are in the frontline of a hospital system in severe crisis after years of cutbacks by neo-liberal Labor governments. O'Bray Smith, a midwife representing the Nurses Federation, told the protestors that she had been taught at school that in the late nineteenth century the trade unions had formed a party to represent the interest of the working class. But today, she and other trade unionists are fighting a privatisation- mad NSW Labor government. "I've spoken to many rank-and-file members of the Labor party and they can't believe what is going on. And many are not going to vote Labor in the next elections as a result."